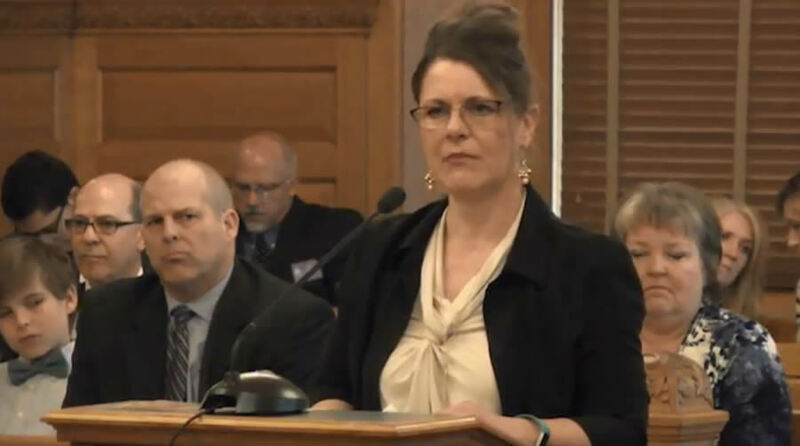 Sheryl Crosier, Simon's mother, testifies at a hearing in Kansas in support of Simon's Law. Sheryl Crosier’s son died when he was three months old. He had been diagnosed with Trisomy 18. While complications from the syndrome can be fatal, some patients live years after the diagnosis. His doctors had a different idea of how long he should live. In Simon Crosier’s case, doctors placed a Do Not Resuscitate (DNR) order, along with a “comfort feeds” order in his medical chart. They didn’t ask or tell either parent. Simon passed away on December 3, 2010. Read his heartbreaking story here. “What we think is, he died from denial of care, clearly, from withholding care, giving medication and doing things that were not appropriate,” Crosier told The Stream. Crosier is working to change that for other sick children. Missouri hasn’t yet passed the bill. It was heard in the committee Monday at noon and no one opposed it. It is expected to pass out of committee next week. Kidd’s H.B.138 requires the doctors to have a conversation with the family. The hospital will then have to document that and provide two independent witnesses, Kidd told The Stream. “You can be right, but you can be dead right,” he continued. “So, you have to learn how to fight them. If you put too many things out there you can be dead right.” That’s why he must keep it simple. He can go after futility policies later. And the DNR doesn’t have to do with only sick kids. “This can be your 16-year-old child who’s had a car wreck and come in and not showing any brain waves.” The doctors can determine that the teenager’s injuries are “not compatible with life” and stick a DNR in his chart. It’s important for all parents that they have a say in what happens to their child. Other states are embracing Simon’s Law. Kansas passed an earlier version of Kidd’s bill. Representative John Whitmer sponsored it in the House. “Fortunately, we hadn’t had a case like [Simon’s] yet,” he said. “So, this was more of a pre-emptive parents’ rights case.” Governor Sam Brownback signed it into law in 2017. “Just because someone is special [needs], it doesn’t mean that the hospital should be able to say, ‘Nah, you know, we’re going to terminate their life,'” he added. “That really should be a decision that should be up to the parents.” He pointed out that a woman testified before the committee that her daughter, who had Trisomy, lived to the age of 18. Representative Fred Deutsch in South Dakota presented the bill and it passed unanimously out of the House Health committee. It passed out of the South Dakota House Tuesday with a vote of 68-0. Deutsch is hopeful that the Senate will pass it as well, he told The Stream. He was able to sign up 70 out of 105 South Dakota legislators to co-sponsor his Simon’s Law bill. The bill requires that physicians have a conference with the parent or legal guardian of the child prior to putting a DNR order in the child’s chart. If the parent or guardian objects, the doctor may not order a DNR until an objection is withdrawn or a court orders it. To see more of Simon’s story, click here.